Any hobby can be expensive. Sewing is not any different. There are the right tools for the right job as my father-in-law would say. He was a general contractor and I swear he had ever tool known to man! He also had a way of making the storage of his stash more economical with unconventional methods. My favorite was the use of old coffee cans for screws, nails and bolts! We still have many of these now vintage cans in the garage storing those right tools for the right job :o) So, when I need ways to store my sewing items, I am always on the look out to find ways that are economical, functional and ( of course) nice looking! 1. Clearance planters from Lowe's garden center. These were in the clearance for $1 a piece! I love the bright colors and sizes. I also bought two larger ones for my kitchen for $3 to hold my most used kitchen tools! 2. Nails! I never have to look all around to find my favorite rulers when there are in plain view! Nails so inexpensive and since we have coffee cans FULL of them, it makes it even better at FREE! There is an extra one for my little design board made from a clearance canvas ( $2) from Joann's and some flannel! 3. Always keep your eye on clearance items wherever you roam! It can be Target or IKEA...walk those aisles with your eyes peeled for a good deal that can help you get organized! I went to IKEA last week and found shelves ( that I needed) in the AS-IS for 30% and already assembled! Time is money so I nabbed them immediately! Then I did a happy dance! At Target, they were having a clearance on these wire bins. I love them for being able to store large amount of fabric scraps and still being able to see what I have on hand. 4. Vintage ladders. This ladder was found in an off the beaten path shop for $8. It is lovely and old with loads of wear and dried paint splatters. This is one of my all time favorite finds! 5. Wine rack from World Market for $14! This one was so much fun! I was in World Market with the teenager, she would move into WM if I would let her and this was in the clearance by the kitchen items. The only thing better than World Market is World Market CLEARANCE! 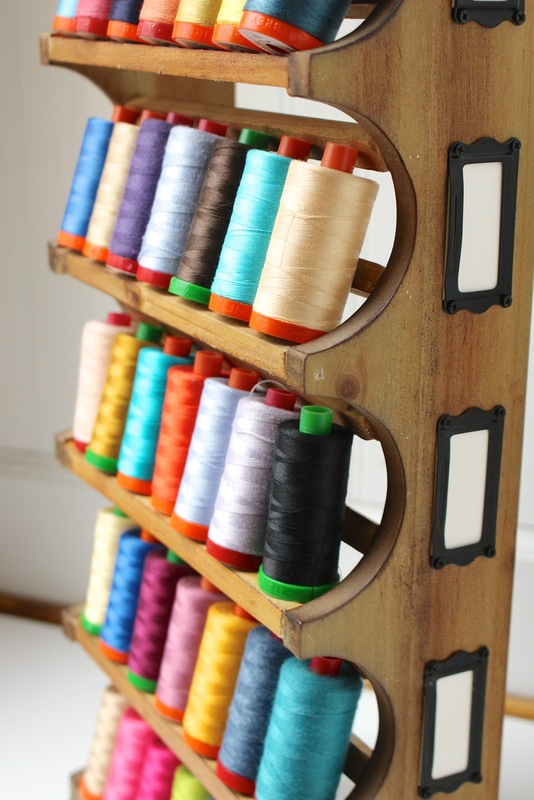 Looking at it, I could not help but wonder if thread spools would fit when it was turned upright. As luck would have it, I just happened to have a large spool of Aurifil thread in my bag ( doesn't everyone) and the fit was perfection! I will be hang in this one on the side of a shelf soon! 6. Vintage bowls! This beautiful Fire King bowl was found at a local Salvation Army for $1. It is amazing what you can find in thrift shops. On the shelves in my sewing space are also vintage bowls that were the in house engineer's grandmother's bowls. Some of the most priceless items are free. Having the family history in my room is wonderful! 7. Ball canning jars. Are you a scrappy sewer? I have more scraps that I have sense honestly! The large Ball canning jars are so perfect for storing a small bit of scraps for use or display! They just make me really happy! 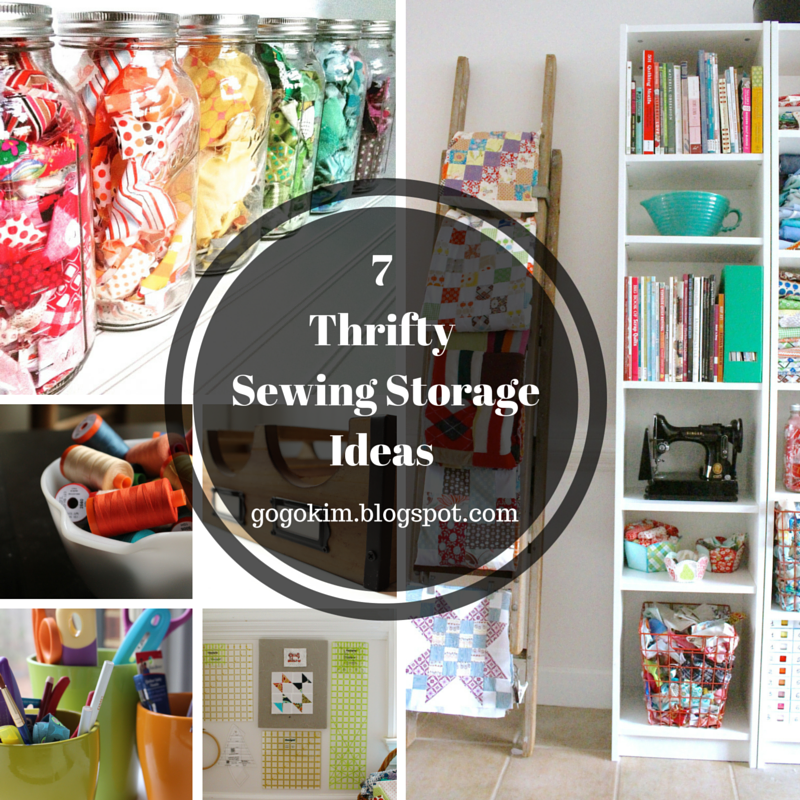 Do you have some cool ideas for great sewing storage? I would love to hear about them! I just love re-using packaging boxes from gifts etc. I have a variety that I use for different sized scrap squares. One fits my 2 inch squares in 9 piles perfectly, one for a mix of other sizes, some as project boxes (the ones with clear plastic lids. At Christmas we received a small hamper that came in a basket lined with red and white polka dot fabric so that is now my scrap basket. Its always funny on Christmas Day when I get just as excited over the packaging as I do over the gift inside! I also just had my hubby put another hook for rulers on the side of my desk for those times when you are using several but don't want them all on the desk at the same time. So much easier than searching under fabric for them! so many great ideas here the wine rack is my favourite,it is such a good idea to have containers etc that you can see through, most of my stash is in chest of drawers well 2 sets and a large bedding box and of course I always look in the wrong one first! Also have really useful boxes with projects scraps etc in Seem to have stitchy stuff alllover the house even in the donstairs loo where I have an assortment of ironing pads, boards etc. That wine rack is perfect for thread! What great ideas you've got for this and that. My neighbors remodeled their very old kitchen and gave me a couple of old drawers, one had a little cutlery drawer in it. That's what I use for my thread and the larger drawers have fabric in them. 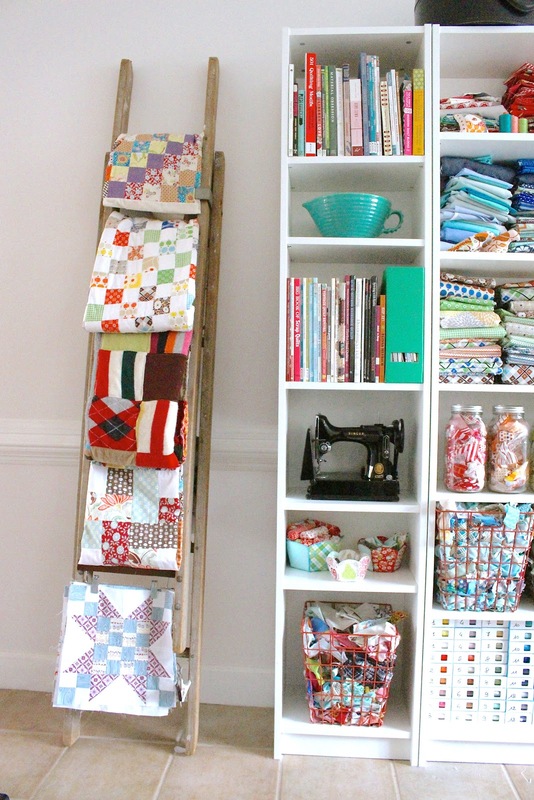 I mostly use bins for my fabric, all bought from Ikea ~ the best place on earth for great stuff! I have a hatbox shaped gift box that I use for fused fabric scraps. As for that mini design wall, another option is to use an old (or thrift store) picture frame covered with flannel. It will still hang on the wall. And for individual blocks, why not an easel type desk frame that can sit right by the sewing machine? I love your ladder find and the ball canning jars. Oh, and the wire baskets. Such great ideas. Great stuff here! I am going to try some of these as I organize my sewing area. What a great idea to use some favorite vintage bowls and other dishes...putting one collection to use storing another! I use a tool chest with sliding drawers to keep my scissors, rotary cutter, extra blades, pressing sheets, tube turners,(especially the metal ones with hook); & some of my rulers that are so easy to lose. I will be taking some of the extra bowls in the kitchen. I never thought about that wine rack holding threads! Such great ideas. I keep my zippers in plastic boxes. Makes it easy to find all of them & not have unwanted folds that seem to never come out after ironing! I bought 2 sets of these fabulous storage systems from IKEA, they hold all my stash one side hold all the larger pieces separated into colours per tray the other side holds all the scraps so for instance top tray on left has full pieces of anything red, top tray in right hand bin has all the red scraps. http://www.ikea.com/aa/en/catalog/products/S89905735/ So cheap to get organised and much better than those big plastic buckets where I could find a thing and the fabrics got really crushed. gave me. He has passed away since. I keep the bowls on a shelf in my sewing area, filled with unique buttons and old wooden spools. I also have the quart size jars filled with buttons. One jar for each color of buttons. They add color to the area and I can see what buttons I have. I love all these ideas and almost all of these items are sitting around the house. Great article!! I use a large china cabinet that was passed down to me from my great-grandmother to store my fabric in. Since it's clear glass on the front, I can see easily what's in there. I have a shelf just for batting and flannel, another for batiks, fat quarter bundles, and all my white/cream fabrics, and then the other shelves have stacks of fabric sorted by color. 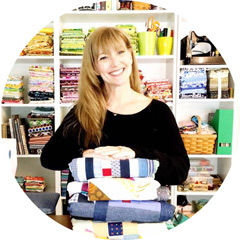 That's really helped me see what fabrics I have, plus it looks pretty with all the colors in there! Arts and Crafts can get very messy with the amount of things that you need to have on hand so that you can do what you need to do. Storage solutions are definitely high in demand for people who love to make things! Most of my fabric is stored in a retro style(60s) china cabinet. It has sliding glass doors on top and 3 wooden doors on the bottom. I keep all my quilting cotton above, where I can see it. All other materials are below. 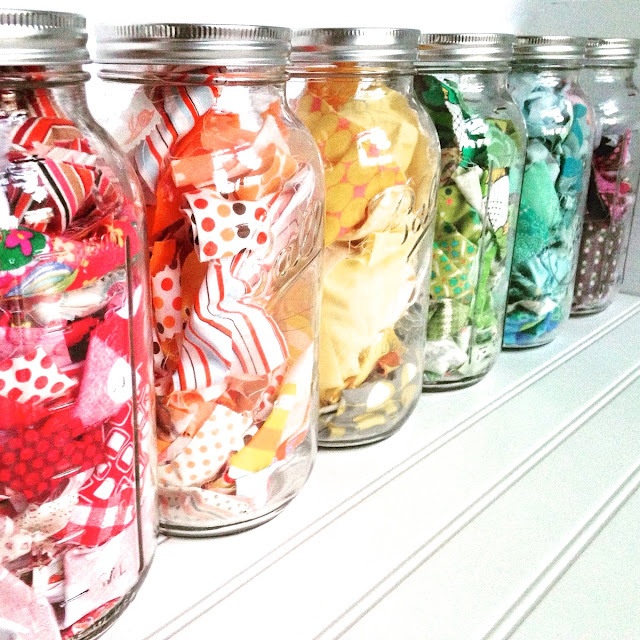 I use retro, round clear glass candy/ cookie jars to store my smaller scraps. I like the idea of the bell jars though! Thanks for sharing such great, economical ideas!